If you’re looking to enhance the look of your motor then diamond cut finishes are proving very popular; involving the removal of a thin layer of alloy from the wheel, we use a specialist lathe. We apply a specialist lacquer to complete the finish and prevent corrosion, leaving the wheel with an extremely shiny finish, similar to that of the back of a CD. While diamond cutting wheels can only be performed a few times, the result is highly favourable. If you’d like to know more about diamond cut alloys, get in touch with the friendly team at Auto Medics on 01494 533 534. If you’re looking for the ultimate look for your wheels this new year, we highly recommend checking out diamond cut wheels. Diamond cut wheels are achieved using a specialist lathe to machine the face of the wheel to accomplish a polished two-tone finish. Diamond cutting can sometimes be referred to as diamond turning. We, at Auto Medics in High Wycombe, offer the increasingly popular diamond cutting service. 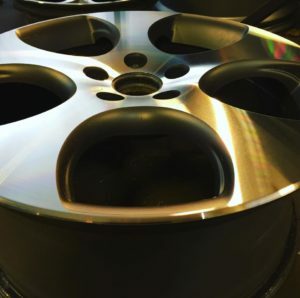 Manufacturers are increasingly supplying diamond cut wheels on new cars but if you aren’t in the market for a new motor at present, we are one of the few body shops in High Wycombe and surrounding areas that have the capability to help you achieve the desired look our diamond tipped lathe produces. If you have diamond cut wheels already, we can also offer a first class alloy wheel refurbishment service that will return your wheels to their original pristine condition if the elements have started to take their toll. For more information about diamond cut wheels or to book in your wheels for our diamond cutting service call us at Auto Medics on 01494 533534 or drop in to our body shop in High Wycombe. If your alloys could do with some attention, be sure to get in touch with us at Auto Medics in High Wycombe. We are the only diamond cut specialists in High Wycombe to offer you such a professional finish. Drop by or call us on 01494 533 534. At Auto Medics, based in High Wycombe, we specialise in alloy wheel refurbishment. As anyone that values their motor knows, alloy wheels means the value of your vehicle can increase significantly, however they can also be costly. That’s why we want to tell you about the benefits of our alloy wheel refurbishment service. The cost of alloy wheel refurbishment is much less than a brand new set of alloys. Often customers drop in to ask about new alloys believing their existing alloys are irreparable. 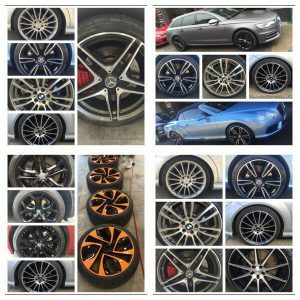 Usually we are able to save our customers the cost of a new set of alloys by setting our expert alloy wheel refurb specialists to work on your current alloys. Our specialist team are extremely capable of repairing some of the worst damage your alloys have sustained. An added benefit of alloy wheel refurbishment is that repairing your alloys before deciding to sell your car will increase the price you get for it, and not only does alloy wheel refurbishment save you money, it will also enhance the performance of your vehicle and its brakes. If you think you’re in need of a new set of alloys, bring your motor down to Auto Medics in High Wycombe. Our alloy wheel refurbishment experts will work their magic and save you money. 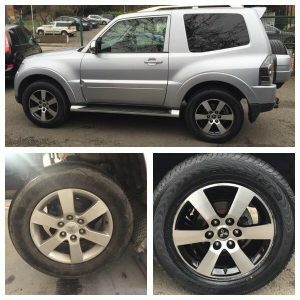 We also offer a mobile alloy wheel refurbishment service in and around High Wycombe, for more information give us a call on 01494 533 534. The team at Auto Medics High Wycombe are experts in diamond cut alloys; with our own specialist lathe we are one of the only body shops in the local area offering precision diamond cut wheels. Customers are coming from across South Bucks and beyond to have their wheels expertly diamond cut by our skilled technicians. What’s more, we offer diamond cut alloys at competitive prices, beating those offered by a main dealer. We believe a diamond cut finish is the optimum finish, with our specialist lathe we provide precision machine cutting, ensuring the perfect result each and every time. 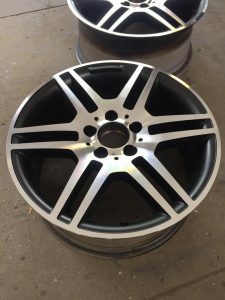 So if you’re looking for a reputable company in the South Bucks area for diamond cut alloy wheels, make sure you’ve got Auto Medics number – 01494 533534 – Or drop in to our body shop in High Wycombe, where one of our highly skilled technicians will offer professional advice and expertly refurbished alloys. To see the amazing results we deliver to our customers check out our Facebook page for before and after shots. At Auto Medics we know that damage to your alloy wheels can spoil the appearance of your car. We also understand that replacing a set of alloy wheels can be extremely expensive. That’s why we recommend you visit our experts who will advise whether it’s possible to restore your alloys, not only to improve the appearance of your motor but maintain the market value. 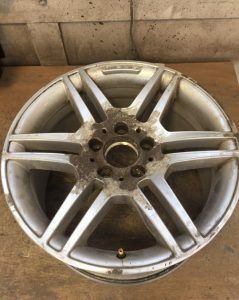 There are many ways alloy wheels can sustain damage, commonly kerb damage is the culprit, but corrosion or discolouration through misuse of chemicals are also issues we, at Auto Medics, are fully experienced in rectifying. Corrosion occurs when protective layer of your alloy becomes damaged leaving your wheel exposed to the elements. During cold and frosty weather like we are experiencing at present, salt from the roads will work to aid corrosion. 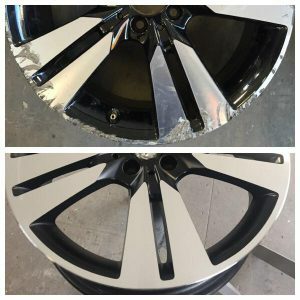 When a diamond cut alloy suffers a stone chip or scratch, corrosion will follow the pattern of the entire wheel corroding your alloys and causing the lacquer to flake off. While initially damage to your wheel maybe cosmetic, left long enough corrosion can cause the wheel to fail. 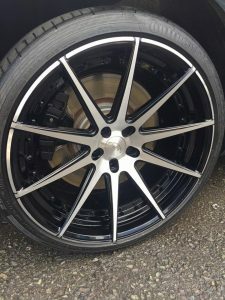 To avoid shelling out a small fortune to replace your alloy wheels, get in touch with the diamond cut alloy specialists at Auto Medics in High Wycombe. Contact us on 01494 533 534 or drop by for a chat and we’ll get you booked in. Earlier this month we looked at the benefits of diamond cut alloys, here we want to give you some insight into how you can keep diamond cut alloys well maintained. During the creation of diamond cut alloys they are first painted the required shade and then baked in an oven. When they are dry the wheel is mounted on a specialist lathe and the alloy is machined to achieve the diamond cut pattern, which is then lacquered to protect and complete the look. There is a trend amongst car enthusiasts to clean their wheels with spray solutions. If you do please check the spray first as acids in some of these sprays can weaken the lacquer and increase your chance of corrosion. The safest way to extend the life of your diamond cut wheels is to clean them with a pH neutral wheel cleaner. Avoid cleaning with acid or alkaline based wheel cleaners as these can often cause discolouration or corrosion when used excessively. The dedicated enthusiasts often to choose to avoid drying with a towel or cloth, as threads can get caught on the alloy, and to use a hair dryer to ensure they are dried completely. In our opinion it’s not an essential step. In reality the key is to dry off any cleaning solution thoroughly and not to leave anything that could potentially react with the lacquer on too long. For the ultimate protection against corrosion and staining you can make use of ceramic sealants, which can last up to two years. Be mindful however that even these won’t fully protect your diamond cut alloys should you incur damage in the form of stone chips or scuff your wheels against a curb or pothole. Anything that allows salt to find its way under the coating, attaching itself to the bare metal, will then lead to corrosion. It’s important that if using ceramic sealants you have this professionally applied as it may require careful application and machine polishing to get it right. If an issue with the surface is sustained this can be difficult to treat in the future. At Auto Medics we recommend the home enthusiast uses a good wheel wax or polymer sealant because these require less experience and can be removed so that areas that require maintenance can be accessed easily should you not apply it perfectly first time. For further information and advice on diamond cut alloys, get in touch with the alloy wheel refurbishment specialists at Auto Medics on 01494 533 534. Does your Motor Need a Spring Clean?